Since 1967, Central Carolina Air Conditioning, Plumbing & Electric has been the leader in providing heating and air services in the Triad, and now we are stepping up that commitment again by introducing an industry first, Whole House Agreement. Service Agreements aren't new in the heating and air industry. 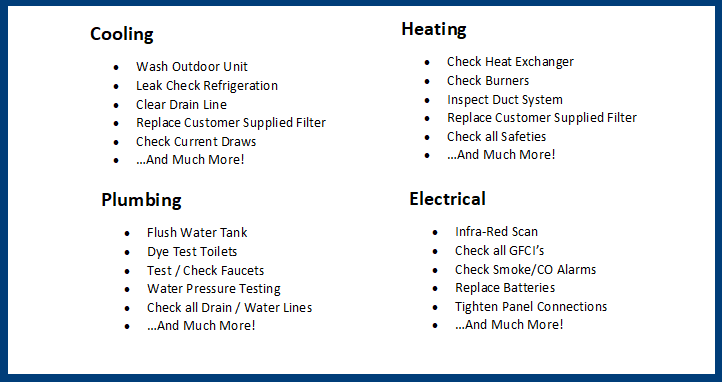 What is new is a program that includes scheduled maintenance of your plumbing and electrical systems along with your heating and air (Policy Assurance Agreement Required). With the Whole House agreement from Central Carolina Air Conditioning, Plumbing & Electrical, you have the peace of mind of knowing that the major systems in your home are regularly maintained and when you need us, "we've got you covered." As a preferred client, you will benefit from our money-saving Value Rate pricing plan as well as the 24/7 emergency service if you should happen to need us in the middle of the night or during weekends, when many other Greensboro, Winston-Salem and High Point plumbers increase their rates.